Thursday, 5th June 2014 felt like a long time coming following my initial signing with Macmillan publishers in September 2012 but the wait was well worth it because publication day DID arrive and what a wonderful day it was. I finally got to experience the realisation of many years writing and studying at university, finally coming to fruition. Waterstones, Nottingham did a brilliant job of hosting the event with Fi and Dan working their socks off to ensure everything went smoothly. I was overwhelmed with the turnout of my launch when almost a hundred people packed into the wonderful Sillitoe Room on the fourth floor. The sun shone and we enjoyed panoramic views of the city as the wine flowed and we enjoyed my stepson Jake’s singing and acoustic guitar-playing as people arrived. It was so exciting to see my agent Clare Wallace, in-house editor Vicki le Feuvre and rights assistant Mary Darby, all from the Darley Anderson Literary Agency in London. My editor Rachel Kellehar and publicist Catherine Alport from Macmillan Children’s Books arrived early to help with the organisation of the event. My family were all there, including my daughter, Francesca and my fiance Mac, together with my other stepson, Nathan and of course my parents. Some people had travelled considerable distances to be there and I so appreciated everyone’s efforts. 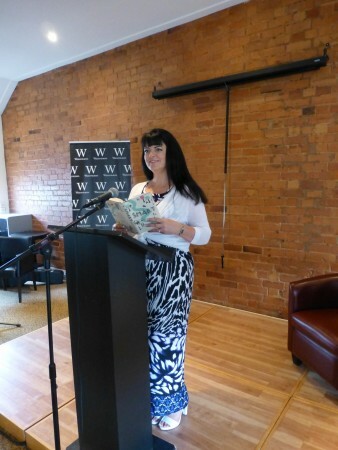 Following a very touching short speech from my wonderful editor, Rachel, I read a chapter from the book and spoke about the writing journey that started proper in 2007 when I embarked on a full-time English & Creative Writing degree, followed by an MA in Creative Writing at Nottingham Trent University. After that came a question and answer session and then a book signing. This went better than I could have imagined with the book selling out and the store taking more orders. The reading: It’s always nice for the author to read a passage or chapter from the book. Choose one that’s not too long but that gives a good snapshot of the main character and encompasses several themes of what the book is about. The author speech/talk: Always good to make notes or pointers in case your mind goes blank but try to avoid reading a speech by rote. Also good to write down the people you want to thank as it’s so easy to forget someone important and spend the rest of your life feeling guilty! Tiredness: Don’t under-estimate how much energy it takes to meet and greet, ‘perform’ on stage, sign books afterwards and then mingle with your guests. Get plenty of rest beforehand and try not to get too stressed – book launch parties are hard work! Enjoy it: – sounds obvious but the time flies by. Enjoy the celebration of your achievement! See me reading a little bit of Smart in the short video clip below!